The flyer for the RACA launch. 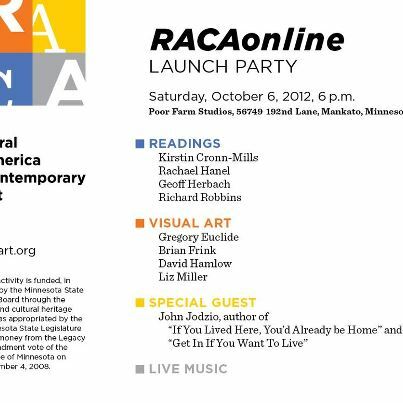 The great folks at the Rural America Contemporary Art organization are celebrating the launch of the RACA magazine and blog at this event Saturday, October 6. I’m thrilled to be among the readers that evening. If you’re in the Mankato area, please stop by! If you’d rather follow RACA from afar, check out the website. If you’re on Facebook, look for RACA’s Facebook page. I’m in the company of some fantastic writers who live in the region. Both Kirstin Cronn-Mills and Geoff Herbach write young adult books that have received fantastic reader and critical appreciation. Rick Robbins writes poetry and directs the MFA creative writing program at Minnesota State University, Mankato.